A few weeks ago my husband's aunt came through Calgary with a big bag of the most delicious looking peaches ever. They smelled and tasted AMAZING! She lives in the Okanagan and these peaches are TO DIE FOR! Even though these peaches were so juicy and amazing, unfortunately I was the only person in the house eating them in any quantity. The kids were trying to help, but my daughter just took a liking to cherries and has been gorging solely on them, and my son, well, he refuses to eat most new things. Now.....What to do with the peaches before they went bad? We just ate a lot of pie..... (see Saskatoon Streusel Pie). I would be the only person to take down a cobbler, and I certainly don't need that. So, I went to Pinterest in search of a peach jelly recipe. I've been on a bit of a jelly making roll lately, so I thought I'd keep that going. What did I stumble upon? A peach jalapeno jelly. I love jalapeno jelly. It's a perfect snack with cream cheese and crackers! It's a staple oh-I-need-a-quick-appetizer-for-this-unexpected-company snack. So I gave it a whirl! 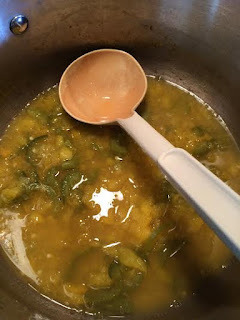 This recipe is adapted from minced blog. I have re-written what I did, below. 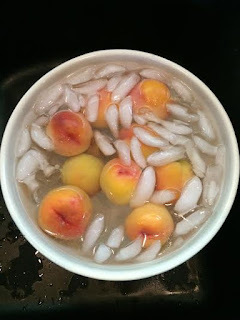 To prepare your peaches, blanch in boiling water for 1 minute. Immediately put them in an ice-water bath to cool off. The think skin should peel right off in a couple of big pieces. 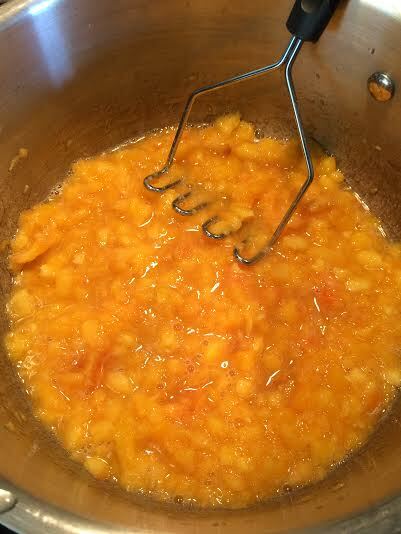 Remove the pit from the peaches and coarsely chop. Put in a large pot with lemon juice. Use a potato masher to squish them into a lumpy puree. Add the vinegar and chopped jalapenos. I left the seeds in half of them. I think next time I'll leave the seeds in all of them for more heat. Bring the mixture to a boil. Turn heat down just to keep it at a simmer, and allow to boil for about 20 minutes. Mash every few minutes. Strain the juice using a fine cheesecloth, or a jelly bag. I highly recommend a jelly bag, which is available by the canning materials at many grocery stores. Do not squeeze the bag. Just let it drip into a bowl until you have 2 cups of juice. Bring the juice and sugar to a boil in a large saucepan. Quickly stir in liquid pectin and return to a hard boil, Boil and stir for 1 minute. Remove from heat and skim foam, if necessary. Fill warm, sterilized 8 oz/1 cup jars to within 1/4 inch of top. Wipe the rims with a clean, damp cloth and gently put on sterilized snap-lids and rings. (I suggest keeping your snap-lids in a pot of boiling water, ready to put on the filled jars). Process in a boiling water canner as suggested for your altitude. It is generally recommended to be 10 minutes at sea level. I do 17 minutes for Calgary. 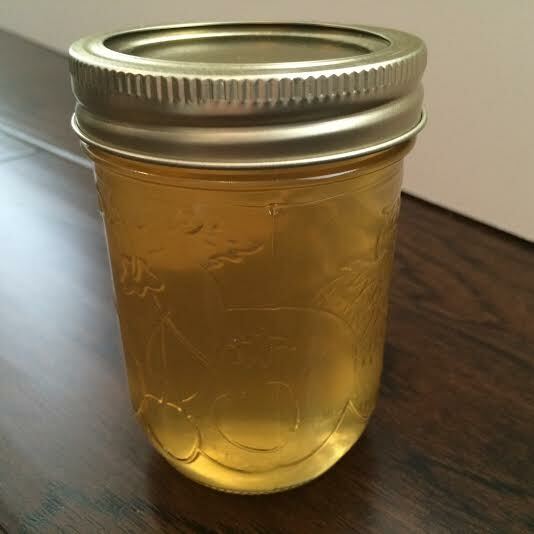 After jars have processed, remove from canner and allow to fully cool, undisturbed, for 24 hrs. Ensure all jars are sealed, and refrigerate any that didn't.